Search Results for "empty hospital room"
Fully-equipped hospital ward with empty bed. Empty hospital room with medical equipment. Burn center, clinic, hospital. First aid room in the hospital. Medical equipment. Postoperative ward. Beds and bedside tables in empty hospital room or a children's camp. 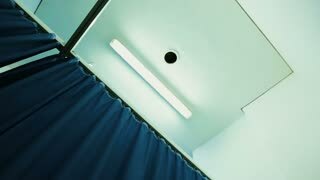 Lowering shot from the ceiling to the floor in a small empty hospital room. Sliding shot of an empty hospital room bed. Lowering shot from the ceiling in an empty hospital room. 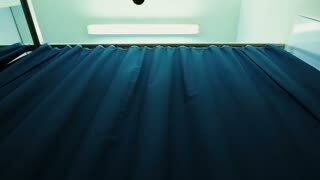 Close up of an empty modern hospital room converts into its wide angle view. 4K. 1960s: Man with bandaged face looks to the right. Empty bed in hospital room. Man lays in bed, looks sad. Men walk in direction of car, open the trunk and put their bags inside. Modern emergency room and first aid room in the hospital. Medical equipment. Empty bed in a hospital room with medical equipment. The ward in the burn center. Two empty bed in a hospital room with medical equipment. 4K. Medical equipment. Empty bed in a hospital room with medical equipment. The ward in the burn center. Hospital room with tomograph. An empty MRI, CT, PET scanner. Fully-equipped postoperative ward in the hospital. Empty Hospital bed covered with white sheet. Preparation for surgery. Room for preparing a patient for surgery. Modern ward at a clinic. Hospital room full of medical equipment. 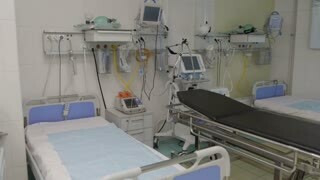 Medical facility with lots of equipment in a hospital room. Surgery room full of medical supplies.